The September 29, 2003 issue of People magazine featured not one but two covers in order to memorialize both Johnny Cash and John Ritter, who had died only a day apart. All the magazines distributed to the central and southwest United States (with the exception of Florida) had Cash on the cover, and the rest had a photograph of Ritter. The latter was sadly a particularly appropriate shot, as he was waving good-bye. Suzanne Somers was named “Las Vegas Female Entertainer of the Year” in 1986. Don Knotts had a troubled childhood. The youngest of four children, he was born when his mother was 40 years old. His father, William, had a breakdown due to suffering from alcoholism and schizophrenia, combined with the stress of having a child so late in life. William would often terrorize his son and wife with a knife, causing the young Don to become a quiet and introverted child. His father died of pneumonia when Don was only 13 years old. Chrissy’s (Suzanne Somers) full name is Christmas Noelle Snow. Joyce DeWitt was arrested for drunken driving on July 4, 2009. Reportedly, police pulled her over after she drove past a barrier near a park. After failing a sobriety test she was arrested, booked at the police station, cited and released on her own recognizance. She later pleaded no contest to one charge, a second being dismissed in exchange for her plea. She was ordered to undergo a nine month alcohol program, was placed on three years of probation and ordered to pay a fine of $510 plus penalty assessments. For decades, it was popular Hollywood lore that Norman Fell and actor Jack Klugman had been feuding bitterly for more than 40 years. In reality, the two had grown up together in the Philadelphia area and were friends. 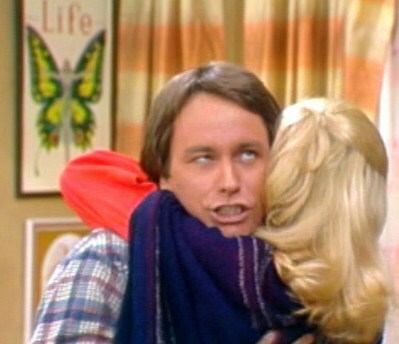 John Ritter was president of his student body in high school and later went to college with the intention of going into politics. He changed his mind after the assassinations of Martin Luther King, Jr. and Robert F. Kennedy. 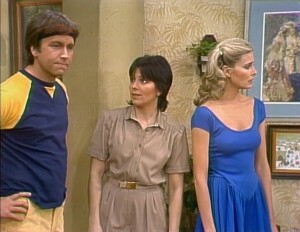 The characters of Stanley (Norman Fell) and Helen Roper (Audra Lindley) were spun off into their own series after three seasons, with the promise from ABC that if their show did not make it past season one, they would be able to return to Three’s Company. Their series, The Ropers, lasted a total of a season and a half, so ABC did not have to bring them back and instead kept Ralph Furley (Don Knotts) as the new landlord.